In the span of two days, the Seattle region’s two cornerstone technology companies showed why they’re the most credible challengers to the current duopoly in mobile computing. And it’s pretty clear that only one has a chance to succeed. First up was Microsoft, which presented (via its desperate partner Nokia) an innovative, interesting-looking pair of smartphones that definitely stand out from other handsets on the market. Then we got the treatment from Amazon, the online shopping pioneer with breathtaking ambitions that include premium tablet computers. The new line of Kindle devices that Amazon showed off Thursday include updated e-readers and three versions of its tablet, the Kindle Fire, which packed big improvements in technology for bargain prices. The two visions on display this week could not have been more different. 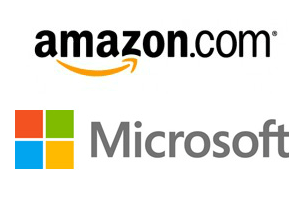 In short, Amazon was showing us the future of consumer mobile computing, while Microsoft and Nokia were speaking a language that dated to somewhere around the debut of the iPhone. In this knife fight for consumers, only Amazon’s vision will truly have a chance of making a difference. Sadly for Nokia, and by extension poor old Microsoft, the inability to see where modern digital consumers’ hearts lie will spell doom. Even if you’re a critic of the company’s many hard-to-swallow stances on public policy issues, success for Amazon in the tablet market will be a good thing for the consumer and the broader technology ecosystem. And a failure for Microsoft, no matter whether it’s deserved, would be a huge loss for more than just the folks in Redmond. There are some complications here—mainly that Amazon uses a heavily customized version of Android to run its tablets. But remember that Amazon’s fiddling cuts out Google’s digital services, like location and other key data-mining efforts, making the OS its own. The Windows Phone operating system is a very well-reviewed product, and certainly presents some innovative features and a much different experience for the user than the other modern operating system. But it’s got a tremendously late start on making up the gap in smartphones. Nokia, once a global leader, has tied its fate to the Microsoft platform. And Microsoft certainly needs its closest and most important smartphone partner to succeed with its treasured OS, if it hopes the platform to do well. But the pair is so far behind that it will need to absolutely market the living daylights out of these phones to make a real dent. And the first salvo of marketing, this week’s big presentations from both Microsoft and Amazon, had me feeling much more dubious about the Windows Phone’s prospects. While the Nokia/Microsoft device unveiling was chock full of features, brand names, corporate executives, and fancy multimedia, it was fundamentally selling a product from a time gone by. Buy our phone—it’s got the best camera! Its touchscreen can be used with gloves! Its polycarbonite shell is a beautiful, durable wonder! “Last year, there were more than two dozen Android tablets launched into the marketplace, and nobody bought ’em. “Why? Because they’re gadgets, and people don’t want gadgets anymore. They want services that improve over time. They want services that improve every day, every week, and every month. xbox live, xbox music and video, skydrive, I’m not really sure which services you think MS are missing…? The problem is that they don’t promote those things with their phones well enough to consumers like Amazon just did. Uhm… Amazon’s stuff is clearly from the time BEFORE the iPhone. Nokia showed us the future, and it is pure. Don’t listen to these two Microsoft head-in-the-sand ostriches. Having a disjointed and non cohesive handful of services isn’t good enough. The level of competition out there with regards to providing a coherent combined package of all these elements which is streamlined into tablet form is the minimum now. Amazin has that and Apple has that. No one else does. Even if you suddenly burst onto the market with that package, it still isn’t good enough because Apple already dominates mind share. Bill Gates once said your product must be 30% better than the market leader for you to have a chance of winning. I hate interacting with MSFT people these days because they are incredibly fatuous about their real place in the market. Bluster and dismissive ness don’t solve the problem, recognizing what the problems are and solving them is the only way to go. Amazon will fail. Barnes and Noble’s Nook shows that it can be done a lot cheaper and with stores that let customers try ’em out. The Nook also doesn’t try to prevent users from doing what they WANT to do. All from a low-tech book seller. Amazon can barely compete here. Microsoft is lost. Some products are amazing but they’ve failed at mobile for 12 years and counting. Their new OS is actually great, but few outside of Seattle have ever even seen it. The saddest thing is talking to someone at Microsoft that thinks they’re winning! If they were innovative they might do something like buy T-mobile to get the distribution channel. To early to declare a winner, if Apple release a 7″ iPad it will put the brakes on amazon and google. The Microsoft WIndows RT & Windows 8 tablets are going for a slightly different audiance – those who want to consolidate their consumption and productivity devices. -Games drive purchasing behavior more than anyone wants to admit. -Microsoft mobile has no games because they do not support the open standard for 3D graphics, OpenGL. Therefore, porting a game to Windows Mobile is a significant rewrite no one wants to do. So the door is wide open for anyone who provides a decent minimum performance level and support for OpenGL. Customers do not understand hardware specs, but they do understand price. The value of your platform is defined by the worst hardware spec you allow. Customers will buy your cheapest offering, and then when they find out it isn’t actually capable of performing they will never choose your brand again.